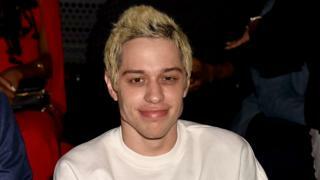 Pete Davidson has spoken out for the first time since his split with Ariana Grande. The 24-year-old SNL comedian jokingly asked if there was “anybody looking for a roommate?” at a benefit gig. He was doing stand-up alongside Judd Apatow at a benefit gig for the Democrats in LA. This is the first time Davidson’s split from the singer has been acknowledged publically. The pair first got together in May and became engaged shortly after. They moved in to 25-year-old Ariana’s apartment in New York and spent most of the summer together, but it was not meant to be. US sources reported last week that the pair had agreed “it was not the right time for their relationship to take off”. Davidson’s stand up set followed on from Judd Apatow at the event, joking “who wants to follow that?”. Whilst Davidson didn’t address what had happened to Ariana’s engagement ring or the pair’s pet pig, Piggie Smalls, he did joke about all the tattoos he got during his five month relationship. “I’ve been covering a bunch of tattoos, that’s fun. I’m 0-for-2 in the tattoo department,” he joked. “Yeah, I’m afraid to get my mom tattooed on me because she’d leave”.